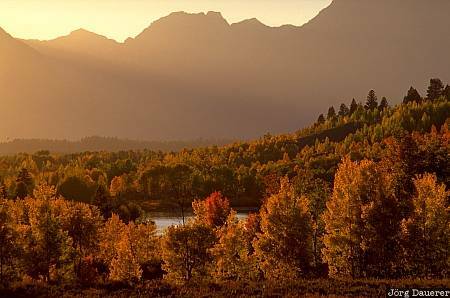 Spectacular fall colors in Grand Teton National Park with the silhouettes of the peaks of the Teton Range in the background. Grand Teton National Park is in the west of Wyoming, United States. This photo was taken in the late afternoon of a sunny day in late September of 2003. This photo is part of the exhibition Autumn (October 2006).